Back in my flight attendant days, I generally bid to work the first class cabin. Not only were there fewer seats giving you fewer mouths to feed and water in that section of the plane, every so often you'd get to mix and mingle with some of the greatest (and worst) and/or famous (and infamous) people on the planet. I met Muhammad Ali this way and Jonas Salk. Lady Bird Johnson, Pele, Walter Payton and Jesse Jackson. Billy Joel, Bobby Vinton, Cheap Trick, Amy Grant, Dream Theater, Ozzy Osbourne, Daryl Hall, Smokey Robinson. Oprah Winfrey, Weird Al Yankovich, Lee Majors, Anita Hill. The Toronto Blue Jays immediately after they won the World Series. Morley Safer, Bill Wallace, Lesley Stahl, Ed Bradley...the 60 Minutes gang on separate flights and times. Frankly, I crossed paths with so many over my 15-year career that I can't even remember all of them anymore. And, looking at the brief list of names above, I can see I'm dating myself. Now you hardly ever see a meal even in first class, and even rarer still are celebrity sightings -- many fly on their own (or shared) leased aircraft these days if at all possible. But back in my day, one celeb that I kept running into (not one, not two, but three separate times during my career) on my flights from Chicago to New York City was comedian George Carlin. He always had the same vibe on board as he has on stage (I've seen him there, too): a little rough around the edges, a compelling if no nonsense figure, mischievously witty and sharp as a tack. And always, always a bit annoyed. Carlin is known for his colorful delivery and razor-sharp examination of the English language -- and the humans who use and abuse it -- in all of its quirky wonder. Here's a classic bit (fortunately, a Sunday morning-friendly passage) on combat PTSD, a selection called 'Euphemisms' from his Explicit Lyrics CD. From the New York Times, the first in a series ('War Torn') looking at some -- statistically but the slightest sliver of those who have served and returned without incident -- of our Iraq and Afghanistan veterans who have been charged with or committed murder, murder/suicide, manslaughter, etc. This is difficult information and should not be used to demonize our veterans. Rather, we need to use such accounts to better understand our collective role in not doing more to ensure our returning troops have all the tools and help necessary to make their post-combat deployments as successful as possible. 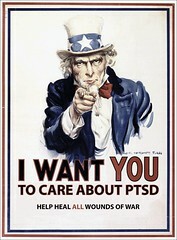 When veterans of America's two current wars — Iraq and Afghanistan — tried to sue the Department of Veterans Affairs for failing to process thousands of claims for post traumatic stress disorder (PTSD), the Department waved them off saying they had no right to do so. The VA said that Congress had set up an administrative — not judicial — process for evaluating individual disability claims. The veterans, it declared, just had to wait for bureaucracy to take its course — no matter that it has a backlog of 600,000 unresolved claims, each of which can take up to six months or more to process. What Will 2008 Hold for OEF/OIF Vets? Apologies for being so silent on this end over the holiday season. While the media has this past year done a better job of investigating and reporting on the issues that concern our returning troops and military families, I've been able to take some much-needed time off following an incredibly busy year. Last month's weeks of completing finals, preparing and testifying before Congress, my birthday, the holiday rush of commitments and gatherings, and being under the weather for most of that period, was a remarkable culmination of an even more incredible year for me personally -- and for the issue of combat PTSD. Remarkable, yes, but exhausting, too! And so, I'm late in posting my review of all we've accomplished in 2007, but hope to have that for you soon. What will 2008 hold for our returning veterans? We now find their needs examined and more fully brought to light in the public sphere. Will we be smart enough to act on what we've learned?